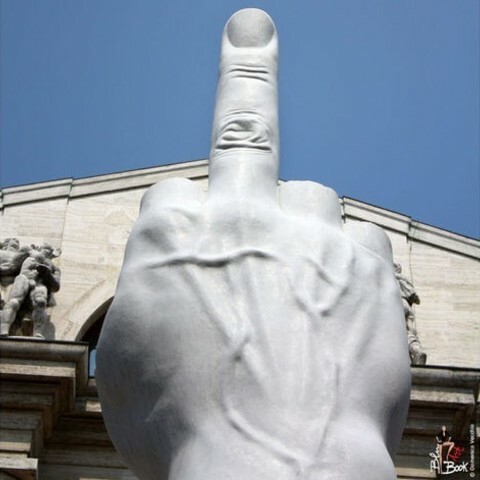 This very discussed Artwork is located in Milan, in front of the Borsa di Milano. It's 11 meters high pure Carrara marble, 4.60 meters of real sculpture and 6.40 meters of its base. It depicts a hand intent in the Roman salute, but with the severed fingers, as if they had been eroded by time, with the only medium left erected, to overturn its meaning. The work is placed in the middle of Piazza degli Affari, just in front of the Stock Exchange, that Palazzo Mezzanotte built between 1927 and 1932, then in the Fascist period, as his style suggest. 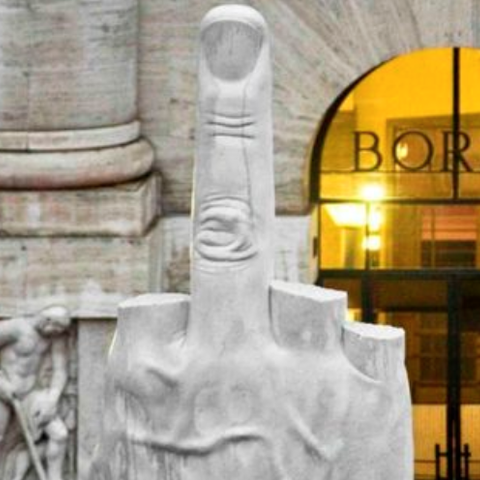 Cattelan's work thus becomes both a critique of the building's substratum and an irreverent gesture towards what it represents today: the world of finance, seen as stateless, globalist and metaphor of a new fascism. Last but not least, it's absolutely easy to print :-) You can make it without support very easily, no matter what scale.